As every engineer knows, the skills required to succeed in the workforce are quite different than those they learn in academia. In academia, the primary focus is an individualistic pursuit of learning, and the academic infrastructure emphasizes this point. In industry, the primary focus is an enterprise executing to an overall mission. Thus, it is very important for the team to work cohesively, with understanding of roles, and managing internal and external relationships. With this dichotomy, industry has resoundingly indicated that they would like students with "soft-skills," but the broader meaning is the need to find employees who can function well in an enterprise. Academia is ill-positioned to offer such a capability due to three reasons. First, due to its relative isolation, academics do not know what it takes to operate in the enterprise environment. Second, when they try to do so, they lack credibility. Finally, communicating the context of an enterprise requires interactive role-playing which cannot be easily done in a traditional lecture format. 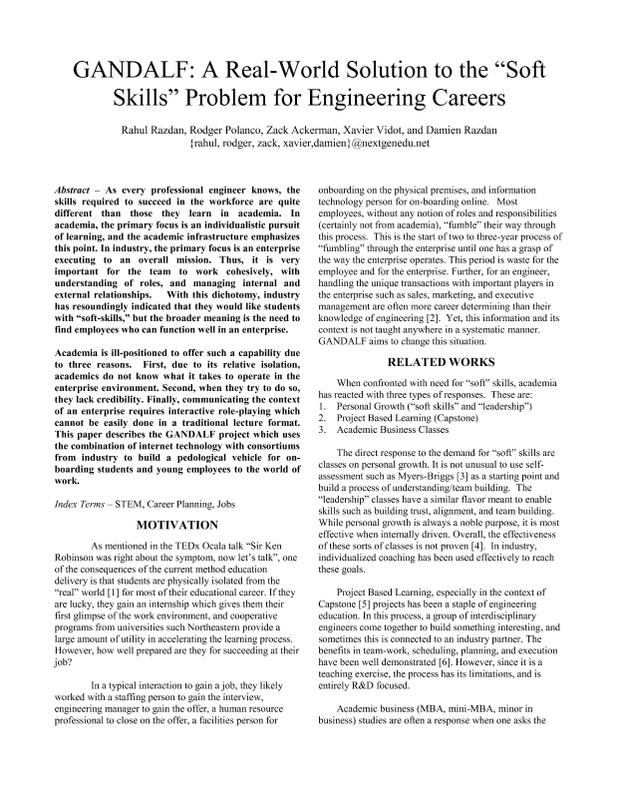 This paper describes the GANDALF project which uses the combination of internet technology with consortiums from industry to build a pedagogical vehicle to on-board students and young employees to the world of work.